LG G Vista firmware download will be the main topic of our today’s article. Here you will find some firmware for the smartphone. LG G Vista smartphone was released in 2014. It quickly became popular due to its interesting features and attractive price. The smartphone is known under the number model LGVS880. It is distributed via Verizon service provider. Below you will find all the necessary files, including LG G Vista firmware download and instructions on how to install the firmware. But first let's recall the main features of LG G Vista. LG G Vista was one of the first smartphones with 5.7-inch screen. At that time it was considered a very large screen size, but thanks to the thin frames around the display, the smartphone is quite comfortable. Also, LG G Vista has 1.5 GB of RAM and 8 GB of internal memory. On the rear panel of smartphone is 8-megapixel camera, and on the front - 1.3-megapixel. The smartphone supports all mobile networks, including 4G LTE. In general, LG G Vista is an interesting device with a large screen and medium performance. Now let's look at the firmware for the smartphone, as well as instructions on how to install it. 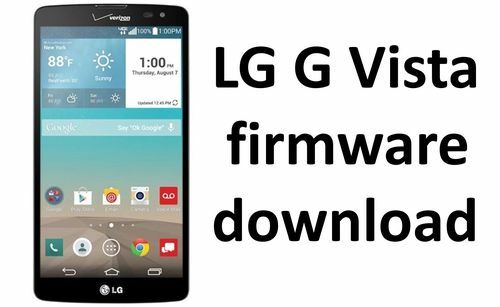 Read here how to install LG G Vista firmware. If you still have questions, or some links for LG G Vista firmware download not working, please write comments below.